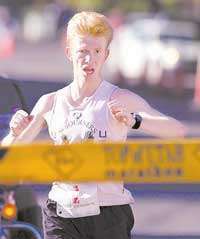 Deseret News Marathon. 2:31:47, third overall, first Utahn. My goal was to make top three, and to win the first Utahn prize. At the start, we had Simon Sawe, John Ndambuki, and Jared Nyambuki of the Kenyans, and Steve Ashbaker and Corbin Tally of the locals. So I had to find a way to get rid of one Kenyan, and not get punished by a local for it. A challenging task. I noticed the Kenyans were a little slow at the start, and decided to take advantage of it. I signaled to Steve, and we went off trading leads. 5:04 for the first mile. At about 1.5 Steve had to stop to fix the rock in the shoe problem. So now I was on my own. However, Jared Nyambuki took the bate and followed us. 9:47 at two miles (4:47), then 14:28 (4:41) at three, and 19:27 at 4 (4:59). The pace is actually not as fast as it sounds - this is a 7% grade. Then it flattened out. 24:57 at 5 (5:30), next mile uphill 30:43 (5:46). Nyambuki started pulling away, which was just fine with me. Now we are climbing the Little Mountain. Next mile in 6:29. Sawe and Ndambuki passed me, and they looked like they were racing already. Next mile was half up and half down - 5:59, then down in 5:19. Felt so good I thought it was only 5:30. So far so good. Now a little loop to Pinecrest. This gives me a chance to check what is going on. Nyambuki about 1:20 ahead, Sawe and Ndambuki about 45 seconds ahead, Steve about 2 minutes behind, Corbin about 3 minutes behind. 10 miles in 54:16, half in 1:11:30, and still running relaxed. However, somewhere around 14 legs started feeling a bit cramped, and I slowed down to 5:35 pace. We are still going down the Emmigration Canyon, so 5:35 is not a fast pace, although not too bad. 15 miles in 1:22:26. Then things started getting worse, and I could not quite understand why at first. It was not the fuel, my usual issue, it was the legs, something that usually holds up quite well. From then on, I managed to do 6:00 pace on downhill miles, and slowed down to 6:20-6:30 on the ones with uphill. Around 18 the right hamstring cramped up, but then it felt better. Then I saw Nyambuki on the side of the road, and it looks that he is so cramped up that he cannot even walk. Ok, that puts me in 3rd. Now I need to hold off Corbin and Steve. As slow as I am going, they could come up to me very fast. 20 miles in 1:52:38. Next mile in 6:33 (up), but the one after that in 5:50 down. Now just try to hang in there, and fight the negative thoughts. The subsequent miles were somewhere in the 6:10-6:20 range. Almost missed a turn. Finally, the finish. Yes, I made it! 2:23:15 for Sawe, 2:26:39 for Ndambuki. Finally Corbin comes in 2:40:18 and they carry him to the medical tent. Then Steve comes in 2:47:36, and he is even worse off - two people carry him to medical tent. I guess I did not realize how hot it got once we came out of the canyon. That explains the cramps, the slowdown, and not getting passed through all of this. So I guess given the conditions I was not running that slow after all. A repetition of the lesson I've learned a while ago - never get depressed about slow mile splits, but fight out the battle instead - you might actually be doing quite well for the conditions. The legs were extremely sore afterwards. Could barely walk. Ran with the kids in the evening. Had to lean on the stroller to make it. Ran two miles in the morning in 18:58. Legs are sore just about everywhere - quads, calfs, hamstrings, even the dorsi-flexors. I wish I had taken the stroller with me to lean on. I suppose the balanced soreness is a good thing, though. It means I can use another muscle group as a backup when the primary one fails. In the evening decided to let my legs get some rest, and took the kids to the track so I could watch them run. Also, did bench press with a narrow grip, 3 sets of 3 with 95 pounds. Legs still exceptionally sore. So I had to answer a lot of questions on my temple shift this morning. To my surprise, a lot more people than I thought were completely unfamiliar with the post-marathon walking syndrome. Even I began to take my quick recoveries for granted. However, this marathon has always been past my quick bounce back threshold, and this year was tougher than others due to the heat at the end. Waited until the end of the day to run in hopes my legs would be somewhat normal. Had to lean on the stroller to make in manageable, and ran with the kids. Benjamin gave me a workout hitting the last quarter of his fast 0.5 in 1:38, but I survived. I could probably go more than 2 miles with a heroic effort, but I'll wait another couple of days - I can afford to rest a bit. After that, the preservation of fitness would become an issue, and the heroic effort would be worth it. Also, the muscle recovery is happening already at a decent rate, so the effort would have to be less heroic. Legs still very sore, but better than Wednesday. Did some always on the run jogging during the day to test the waters. In the evening ran with the kids, and then jogged additional 2 miles in 15:48. Also did bench press (narrow grip), one set of 3 with 95, then 2 sets of 3 with 100 pounds. I am finally able to run without feeling extreme pain in every step. However it still hurts. Ran 8 miles with George on trails this morning. Then ran with the kids. Jogged a mile in the evening. Less pain than in the morning, the acute soreness essentially gone. Running was not painful today for the first time since the marathon. Decided to not waste any time and ease into normal training. Figured 5 miles at marathon pace would be a good start, and will show me how the recovery is going. Did it on the Provo River Trail between the Geneva road and the Utah Lake. 2.5 out, 2.5 back. 5:50 - 5:50 - 5:52 - 5:46 - 5:39 - total time 28:57, 14:35 out, 14:22 back. Legs felt weak, but I was able to partially compensate it with an artificilly increased leg turnover on the second half once I remembered the trick. Back in 2004, I did 110 miles the week that would correspond to the next one. In the beginning of the week, I was having a similar problem with weak legs during a tempo run while still recovering from the marathon. But a weak later, the problem was largely gone. So I was able to continue to recover through the high mileage. With that experience in mind, the plan for next week is to resume normal training. However, 90 should be enough mileage. Now I am eyeing four goals - win the Utah circuit, win the Top of Utah, win St. George, and qualify for the Trials in St. George. I believe the last two have to go together - it will not be possible to win St. George without qualifying this year. Steven R. Covey says think win-win. I am not sure if he will necessarily agree with my application of that principle, but I like to give it a different twist - win two marathons two weeks apart. Mike Kirk will certainly have something to say about my ambitions with his legs in St. George. At least he did back in 2004. It is going to be fun.